One of my favorite genres of literature is dystopia, but before I talk about dystopian fiction, let’s take a look at its predecessor. Most people are familiar with the term utopia, which originated with the fictional work by Thomas More published in 1516. Utopia was written shortly after the discovery of the New World, an event which stimulated the human imagination and brought with it a sense of new possibilities. It can be considered the first English science fiction, as the story describes an unreal place (located in the New World) which could be real (at least hypothetically) in the future. More’s imaginative society represents an ideal one in which many social problems are controlled or eliminated, such as war, crime and poverty, yet its plans for social improvement are in many ways impractical. 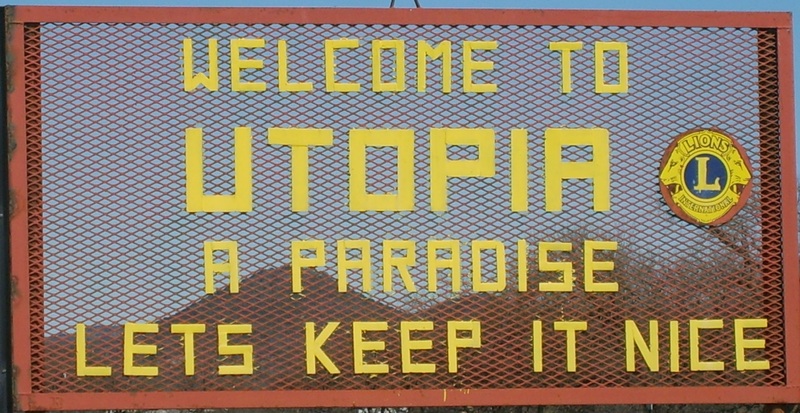 Ironically, and significantly, the word utopia can literally be translated as “good place” or “no place,” suggesting that the author acknowledged that there is no such thing as a perfect society. [A]s long as there is any property, and while money is the standard of all other things, I cannot think that a nation can be governed either justly or happily. It is the fear of want that makes any of the whole race of animals either greedy or ravenous; but besides fear, there is in man a pride that makes him fancy it a particular glory to excel others in pomp and excess. But by the laws of the Utopians, there is no room for this. Thomas More wrote his work as a commentary or critique of the social problems of his day, intending to provoke his readers to consider the issues without attacking or blaming any individuals by name. However, More’s work did inspire the founding of real “utopian” societies, including Marxist Communism. I believe Utopia is an important work to be familiar with and should be included in every high school British Lit course, since the concept of creating a utopian existence still has strong influences today. Utopia is fairly short and not terribly difficult to read, and it’s actually quite entertaining while being thought-provoking as well. Although a few literary works now classified as utopian fiction were written prior to Utopia (such as Plato’s Republic), More’s story has been followed by a continual stream of utopian and dystopian fiction. These stories depict the ideas and efforts of sinful man to make a better world for himself and his posterity. They also show how inadequate these attempts are because man can never save himself or fix the problems caused by sin on his own. Government controls and strict restriction of liberty only band-aids the underlying problem of sin. Man’s laws and penalties may keep sinful behavior restrained to some extent, but they can never create a perfect society or happy individuals. As I said at the beginning, I really like dystopian fiction and have read all of the above, some of which I enjoyed more than others. (In case you’re wondering — yes, I very much enjoyed The Hunger Games books and movies.) A few sort of gave me the creeps, and my least favorite was A Clockwork Orange; I found it rather distasteful and don’t recommend it. Dystopian stories are set in either an “alternate reality” Earth or a future post-war or post-apocalyptic scenario. In all of these stories, many aspects of life are regulated and controlled for the “good of the society,” but the disadvantages and harm to the citizens far outweigh the benefits. Imagine a society in which all books are outlawed and burned (Fahrenheit 451), or one in which it is mandated by law that every citizen undergo plastic surgery at the age of 16 in order to correct physical imperfections (Uglies). Typically in a dystopian novel (or film), there is one character or faction who recognizes the problems in their society, questions and challenges its rules, customs, and authorities, and attempts to remedy, resist, or sometimes escape it. Some characters may be discontent in their situation but are unwilling to resist or, realizing that “resistance is futile”, decide to conform to society rather than suffer the unfortunate consequences of fighting against it. But I like seeing how that one character becomes determined and formulates a plan to oppose the oppression, injustice, or downright evil they observe in a totalitarian society. It even causes the reader to consider: how much would I tolerate, and to what length would I be willing to go in resisting and even fighting against evil, if it ever came down to it? In my next article, I will discuss in more detail one of my favorite dystopian fiction books – The Giver by Lois Lowry. Do you have a favorite utopian or dystopian novel? Is there one not mentioned here that you would recommend? This entry was posted in Adult Fiction, Young Adult Fiction and tagged communism, dystopian fiction, Hunger Games, Lois Lowry, marxism, perfect world, The Giver, Thomas More, Uglies, Utopia. Bookmark the permalink.